As an eater, I am afforded the wonderful opportunity to try so many things and learn about food from different cultural perspectives. Who knew there were 20 different kinds of BBQ in America? Actually, it is probably even more. With Mediterranean cuisine, I learned my lesson early that each country/culture has their own unique flavors and each has pride that sets them apart. YoYo Nikki & Lefty’s does Greek and I know not to generically refer to it as regional fare – it’s Greek! YoYo, Lefty and Nikki all started the cart this past summer after contemplating a restaurant. As with many, they discovered that a restaurant wasn’t accessible in this economy, so they secured a cart and outfitted it. Crazy as it may sound, instead of launching in a pod, their first big sales was at The Bite of Oregon down on the waterfront. What other way is there for one to cut their teeth than with a crowd of 10,000 people a day. 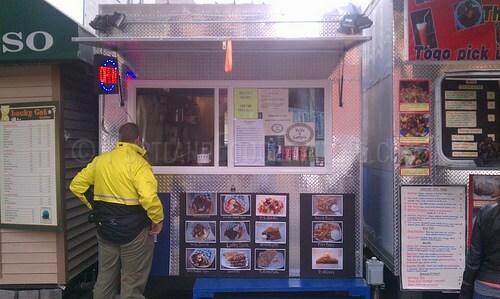 Since then, YoYo & Lefty’s setup shop on SW 3rd and Stark and have garnered a faithful following with the lunch cart crowd.